Oct 31, 2011: For more than four hundred years, astronomers have used telescopes to study the great variety of stars in our galaxy. Millions of distant suns have been catalogued. There are dwarf stars, giant stars, dead stars, exploding stars, binary stars; by now, you might suppose that every kind of star in the Milky Way had been seen. That's why a recent discovery is so surprising. Researchers using the Subaru telescope in Hawaii have found a star with spiral arms. The name of the star is SAO 206462. It's a young star more than four hundred light years from Earth in the constellation Lupus, the wolf. 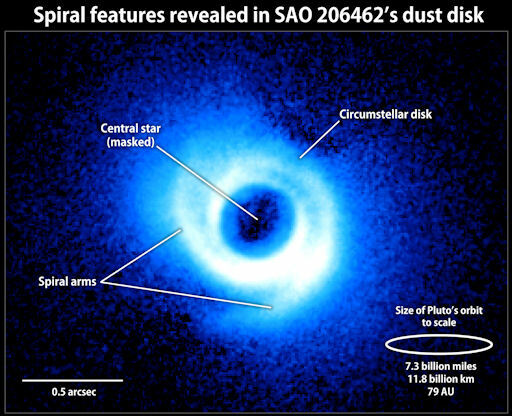 SAO 206462 attracted attention because it has a circumstellar disk--that is, a broad disk of dust and gas surrounding the star. Researchers strongly suspected that new planets might be coalescing inside the disk, which is about twice as wide as the orbit of Pluto. When they took a closer look at SAO 206462 they found not planets, but arms. Astronomers have seen spiral arms before: they’re commonly found in pinwheel galaxies where hundreds of millions of stars spiral together around a common core. Finding a clear case of spiral arms around an individual star, however, is unprecedented1. The arms might be a sign that planets are forming within the disk. Grady revealed the image to colleagues on Oct. 19th at a meeting at Goddard entitled Signposts of Planets. "What we're finding is that once these systems reach ages of a few million years—that’s young for a star--their disks begin to show all kinds of interesting shapes,” says John Wisniewski, a collaborator at the University of Washington in Seattle. "We’ve seen rings, divots, gaps--and now spiral features. Many of these structures could be caused by planets moving within the disks." However, it is not an open and shut case. The research team cautions that processes unrelated to planets might give rise to these structures. Until more evidence is collected--or until the planets themselves are detected--they can’t be certain. Whatever the cause of the arms, their reality is undeniable and the great catalogue of stars has one more type. Stay tuned to science@nasa for future entries. 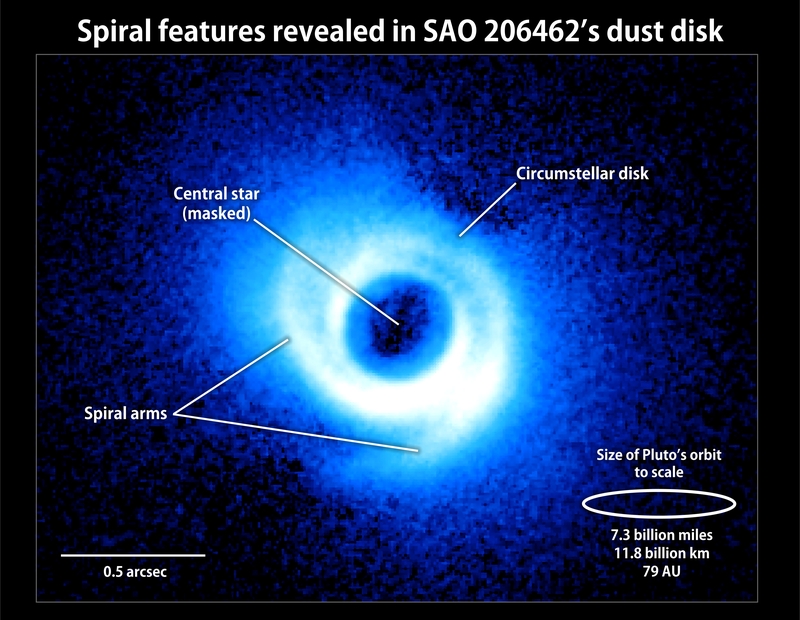 Footnote: (1) "There have been other examples of circumstellar disks imaged with partial spiral arms or blurry spiral arms," notes Marc Kuchner of Goddard, who organized the conference. "So it's not completely unprecedented. But this is really the first clear image of this phenomenon--clear enough that you could trace the arms and possibly use them to make quantitative inferences about what's causing them."